Is Labour crumbling on Brexit? What are we to make of last night’s votes on Brexit in the British parliament? Are we edging closer to a deal in time for 29 March? Or towards a crash out on the same date? Or towards a postponement? You can find advocates of each of these in this morning’s media coverage. The official Conservative line is this: the victory of the Graham Brady amendment shows that there is majority for the government’s deal if only the Irish backstop can be made to go away. So the prime minister Theresa May will go back to Brussels, and the EU side will crack, in spite of all their protestations to the contrary, because they fear a no-deal, which will disrupt commerce, to say nothing of an advantageous legal settlement, and, not least, leave the Irish border in fog. Parliament will then endorse the revised deal, and scramble to enact the necessary legislation to ensure a smooth formal exit on 29 March. This is straight out of the backseat driver’s guide to negotiations, beloved of the Tory Brexiteers, who have shown little skill at front seat driving, but remain experts in the backseat variety. I am very sceptical that the EU side is going to give anything like enough ground. The optimists are looking in the wrong place for potential progress. The key is not the EU officials based in Brussels, but the Irish ones in Dublin. If British Brexiteers show little understanding of EU politics, they are experts in it compared to their comprehension of Irish politics. I’m no expert in either brand of politics, and I had been expecting, even hoping for, signs of flexibility in Dublin, given the terrible impact a no-deal would have there. But there is absolutely no sign of it. I suspect that there is a deep-seated mistrust of British (and Northern Irish Unionist) politicians. The Irish seem to like the EU (in spite of the rough treatment meted out to them in the Euro crisis) because it is their best hope of reducing their dependence on their high-handed neighbour. What we are learning in the whole sorry Brexit business is that politics trumps economics. This is as true of Brexit supporters as it is of anybody else – but their leaders seem to think that what is true of them is not true of their Irish and other EU counterparts. But then again, they aren’t worried about a no-deal outcome either. They calculate that if there is severe disruption, public anger will turn on the EU institutions, which will consolidate the grip of hard Brexiteers on the British political system. They might be right. So is Mrs May’s plan doomed to failure? Actually no. The deeper significance of last night’s votes is that, as the deadline advances, nerves are starting to fray. That is evident in the uncharacteristic unity of Conservative MPs. Only 8 voted against the Brady amendment, and nine abstained. But I think much more significantly there are signs of nerves amongst Labour MPs. Seven voted for Brady and six abstained. That is about double the size of previous Labour support for the government backed approach. Still not big numbers, but is it the growing trickle that suddenly turns to a flood? Furthermore the Labour leader appeared to offer an olive branch to Mrs May by suggesting a meeting, though we shouldn’t expect anything from this. So Mrs May has reason to hope that, when she comes back from her renegotiation with no more than token concessions, enough Tory and Labour MPs who had previously voted against her deal will either change sides or abstain. There will need to be quite a few, though, as there is little chance of pleasing the Ulster Unionists. If that doesn’t work, the only hope to avoid a no-deal is for the government to work with Labour on a new deal, moving to a softer Brexit, with a postponement of the leaving date until the summer. This doesn’t look very likely. Even less likely, based on last night, is that a cross-party group of backbenchers will be able to force a postponement of the evil day. So my interpretation of last night’s votes is that both a deal, close to the existing one, and a no-deal crash, have become more likely, with an exit on 29 March. A postponement, either leading to a softer Brexit or to a referendum are both less likely. And the tension just ratchets up. Posted on January 29, 2019 February 4, 2019 Author MatthewCategories Uncategorized3 Comments on What would a new Brexit referendum look like? 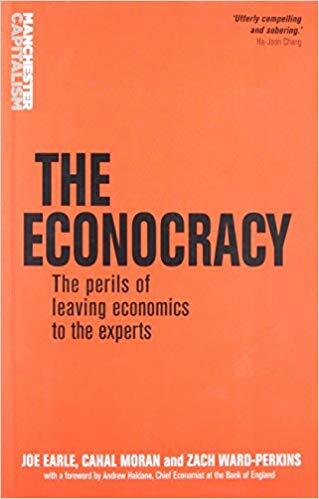 Posted on January 15, 2019 Author MatthewCategories Uncategorized3 Comments on The Econocracy – is something rotten with the state of economics? Like many I was shocked by the recent death of Paddy Ashdown, the former Liberal Democrat leader, at 75. Having seen him in only September I thought that he had a lot more to give. That’s cancer. He was a very special person. I only met him a couple of times. The most substantial was early in his leadership in 1989 when he held a reception for local party chairs at the House of Commons. I remember little of our conversation, except that he had that way of giving you his total attention… and then he was whisked on to the next person by a colleague. After that I was in the same room as Paddy many times, but rarely got beyond a handshake. Unlike many of my Lib Dem friends I have no photo of him and me. I first became aware of him after he entered Parliament as a Liberal in 1983. But his main impact came when he became the first Liberal Democrat leader in 1988, following the merger between his Liberals and my SDP. He was inspirational. His speeches to conference were thought-provoking and inspiring. Looking back on it, a couple of things stand out. First, he really did seem to be in it to promote a cause rather than pursue a successful career. It was typical of him that he saw that the purpose of the party was to achieve real political ends, rather than just being a feel-good place for liberal activists. After saving the party from the oblivion that faced it in 1988 (its standing was even worse than it is now), he therefore engaged with Tony Blair’s New Labour project, looking to a possible coalition. This gave rise to a sort of non-aggression pact which helped crush the Conservatives in 1997 and, with over 40 seats, took the party into the political second division – still the happiest election night I can remember, even though the party lost vote share. The size of the New Labour victory, and ongoing Labour tribalism, meant that coalition was in fact out of the question. But a degree of collaboration with Mr Blair’s government achieved a number of things, especially in the area of electoral reform: establishing a regulatory framework for political parties, which in turn allowed proper disclosure of donations; proportional representation in the Scottish and Welsh parliaments and the London Assembly (and the European Parliament too, though that had less to do with the Lib Dems). The collaboration was quickly dropped by his successor, Charles Kennedy, in 1999, who was much less focused. A second characteristic was his willingness to engage with people. While he did not have much patience with formal consultative processes, he was very happy to listen to people that disagreed with him. He managed to engage with the party’s conference Glee Club, a notorious hotbed of party whingers, while leader and afterwards. No other leader has come close to managing this. Towards the end of his leadership the chorus of whingers was becoming ever stronger. Members struggled to keep up with his bright ideas, and he tended to run roughshod of the party’s internal structures. By the time he stepped down the party was ready to move on to a less charismatic leader who would be more comfortable to be around. He then disappeared from party politics as he was awarded tough diplomatic jobs in the former Yugoslavia, especially as UN High Representative in Bosnia. He impressed many with his energy and toughness, though he inevitably attracted snipers. The contrast between him and his SDP counterpart David Owen, who had earlier also taken on an international role in the former Yugoslavia, showed the latter to be a much less effective operator, for all his clever talk. Paddy was nominated to an equivalent role in Afghanistan, but was vetoed by Hamid Khazai, the Afghan president, doubtless because he knew that Paddy would call out the corruption in his regime. That tells you all you need to know about the failure of western policy in that country. Paddy then returned to Lib Dem politics as an elder statesman, where his role was quite selfless. He supported the party leadership in the difficult coalition years of 2010 to 2015, though he must have had reservations. The then leader, Nick Clegg, then put him in charge of the 2015 General Election campaign. This was not Paddy’s finest hour. He was dynamic and focused, but badly misjudged the Conservative campaign. Whether anybody could have saved the party from its relegation to the political 4th division in that campaign is open to question, but others might have less the party in a less weakened state afterwards. But the really striking thing about this dismal episode was how quickly he bounced back. Unexpectedly the party’s membership surged after the 2015 election, and grew some more with its unequivocal stance for Remain in the EU referendum. Paddy made it his business to engage with and encourage this flood of new members, which had done so much to encourage him. A new generation found him inspirational. By 2016 Paddy’s political judgement was much more realistic. A couple of weeks before the referendum he came to visit us in Tooting, where we were fighting a hopeless by election. He was very gloomy about the probable outcome of the referendum: he had seen the writing on the wall. And, he said, if the referendum was lost then exit would almost certainly follow. He said that it was possible that a Leave result could be reversed, in the event of a constitutional crisis, but that would be so bitter and messy that “it was not to be wished for”. How right he is proving to be. Brexit might yet be averted, but the mess that would leave does not bear thinking about, even if it pales beside the mess a no-deal Brexit would create. Above all I remember Paddy as a liberal whose values I share. A loyal servant to his country, he hated nationalism. He saw that our Westminster-based politics was failing most people, and needed radical surgery. He was not afraid to speak bold ideas, even if many of them did not stand up to close examination. I will miss him a lot. Every nation is riven by historical tensions that are overlooked by their boosters, and yet come to define them. In Britain, the island’s relationship with the rest of Europe, an especially visible problem now, is just the latest iteration in an unresolvable conflict that has been playing since before Julius Caesar. In America we see the conflict between the individualism and vigilantism of the frontier playing out against a worship of the rule of law. Australia, from where I have returned after a six week visit, is no exception. And it approaches a decisive moment. And yet Australians love their country and all the things that make it unique in the world – its breathtaking series of natural marvels; its unique plant and animal life; the astonishing landscapes; the incredible Barrier Reef. They are philosophical about the dangers they bring: poisonous snakes and spiders, bushfires and so on. They are even coming to incorporate aspects of aboriginal culture, especially its art, into their own identity. 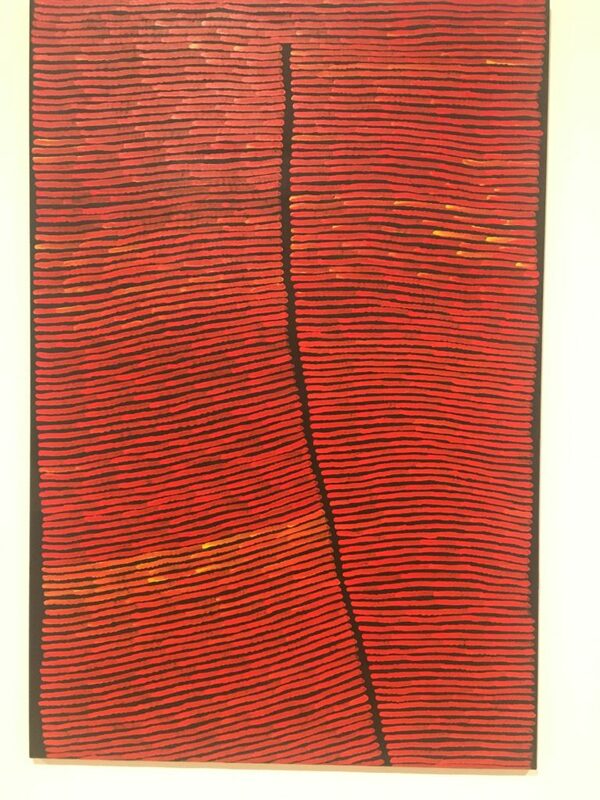 (Indeed in my view the work of modern aboriginal artists, like the one at the top of this piece, are the country’s most striking contribution to the world art scene). 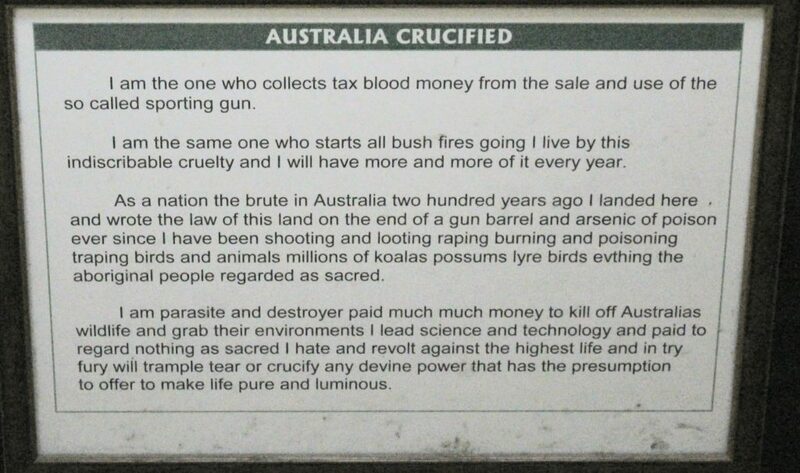 All these things are part of what it is to be a modern Australian. Ricketts’s diatribe and the reserve it is displayed in are as Australian as an open-cast coal mine. And yet the culture of extraction remains dominant. Recently the Economist produced a special report on Australia praising what is, in conventional terms, a very successful economy. But dig deeper and a darker picture emerges. This economic record has been driven by very successful export industries in mining and agriculture. In conventional economic analysis these are highly productive. So much so that they have driven up the Australian dollar to kill off a lot of more traditional industries. In the 1980s most vehicles on Australia’s roads were manufactured domestically. Now local motor manufacturing has ceased to exist. But the conventional analysis does not include damage to the environment. This damage is pretty obvious in mining, which destroys whole landscapes, but it is also severe in agriculture. Australian agribusinesses (I can’t call them farms) are highly mechanised and dependent on artificial inputs such as fertilisers. Earth is left bare for long periods, often allowing the soil to blow away (we experienced a big dust storm in New South Wales). Ideas such as soil rotation are for nostalgic romantics. Meanwhile many of these agribusinesses are being bought by Chinese corporations with no stake in the country’s long term future. Agricultural (and mining) run-off is killing coastal eco-systems, including the Barrier Reef. Meanwhile wasteful agricultural use of water (for example in growing cotton) is also placing huge strains on the landscape. The Murray River runs dry before it reaches the sea. Nobody is more aware of this than the Australians themselves. But the current political leadership, from the Liberal and National coalition, are indifferent. For them the focus is on short term living standards and low taxes. They deny that climate change is anything Australians should do anything about. They readily give permission for new coal mines, even in prime agricultural land. These policies command widespread support, and the coalition’s leaders seem to think that by following Trumpian tactics they can mobilise this support to stay in power. And yet this may well fail. Australia is no America. The coalition has become very unpopular after they ditched a moderate Prime Minister, Malcolm Turnbull, who sought compromises to face up to environmental challenges. The Liberals were crushed in a recent state election in Victoria. Most Australians, it seems, want to find a different way. Actually a more sustainable Australian economy should be perfectly feasible. There is plenty of sunshine and wind to produce renewable energy. The masses of agricultural land could easily be farmed more sustainably. Australians are well-educated, technically savvy and commercially enterprising. They could make more themselves rather than import, using modern AI and robotics. But moving towards such a path would be a shock. It would require a much lower exchange rate, and doubtless a cut to nominal living standards. Are they really ready for it? Perhaps it will require an economic shock. That may happen. Changes to the Chinese economy could weaken the country’s terms of trade. Excessive property prices and personal borrowing may also force a crisis. Australians have come a long way to facing up to their demons. But they now face some important and difficult choices. Australia’s national identity could be o the threshold of a transformation.